Computers can be Locked (using Desktop Shortcut, System Wide Hot Key, Windows Key + L Key, etc) to prevent unauthorised access. Locking of Computer / Workstation can be done either manually or network administrator can create policy to lock computers when computers are left idle for defined duration. Now During this Locked duraration, computer is not used, and normally monitor keeps on running and consumes good amount of electricity. 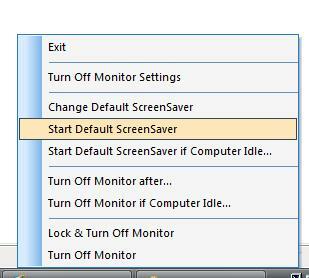 During Computer Locked Duration, Turn Off Monitor Software can be used to Turn Monitor Off and Save Energy. So whenever you lock computer for taking a break etc you can save energy. Download Free Trial of Turn Off Monitor Utility Now and save energy whenever computer / workstation is locked (either automatically or manually). The Turn Off Monitor Software gets a notification from the operating system that the computer has been locked, and the software turns monitor off (The feature need to be enabled from the software). 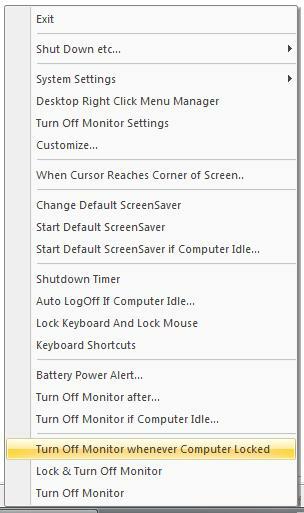 In Order to Lock Computer or Lock Workstation, you can create a Desktop Shortcut from Turn Off Monitor Settings Dialog. Computer / Workstation can be locked by pressing Windows logo key + L Key combination. Once Computer is Locked, you might need password to gain access again to the computer (provided password has been set for your user). Locking Computer can help secure your data from unauthorized access, when you are out of your desk & not using your computer. Now with Turn Off Monitor Software Utility, you can have security of your data & simultaneously you can save energy. To Turn Monitor On, just move mouse a little or press any key on keyboard. For Saving energy, you do not need to change the way you lock your computer, the turn off monitor software utility will automatically turn monitor off, whenever computer is locked (manually or automatically). The small feature can be a real energy saver in a computer network as well. You can also Lock Computer and Turn Monitor Off using Software Download's System Tray Menu or a System Wide Hot Key (which can be defined in Turn Off Monitor Settings). Do have a look at the screenshot above showing the menu option to turn off monitor whenever computer is locked. The screenshots above are of the same software but with different menu option selection & skin. You can customize the menu options to be visible in system tray (as done above). Download Desktop Clock, Alarm Clock, Shutdown Timer, and more software utilities from our homepage.